Periodontitis and gum diseases are considered as major public health concerns as roughly 36% of the world population (15-20% in industrialized countries) suffer of serious tooth tissue damages and tooth decay. The main microorganism responsible for periodontitis and gingivitis is the oral pathogenic bacterium Porphyromonas gingivalis. Infection by this Gram-negative bacterium causes severe lesions in periodontal tissues such as gingiva or the alveolar bone by disrupting the tooth-supporting structure. These damages are induced by a cocktail of specialized toxin proteins secreted by Porphyromonas. These proteins are adhesins and proteases of the gingipain family that help the bacterium to adhere to periodontal tissues and to promote gingival tissue invasion by the degradation of matrix proteins, fibrinogen and collagen. The active release of gingipains at the bacterial cell surface is catalyzed by a recently identified protein complex called the Type IX secretion system (T9SS). This secretion system is composed of 10-14 subunits – encoded by the por genes – that are thought to assemble a trans-envelope channel that specifically recruits the gingipains and transport them to the cell surface, where they are processed to be active (cleavage of a C-terminal sequence and glycosylation). The mechanism by which the T9SS selects the gingipains is not understood but all gingipains carry a conserved C-terminal sequence, called CTD, that may serve as secretion signal, suggesting that the secretion of gingipains relies on a mechanism common to all these enzymes. General mechanism of gingipain transport to the cell surface. All gingipains are synthesized with a N-terminal signal peptide allowing export to the periplasm via the Sec pathway. Once in the periplasm, they are addressed to the cell surface by a dedicated complex constituted of the products of the por genes, the T9SS. The gingipains carry a C-terminal motif, the CTD, that might be required for recruitment to the T9SS. 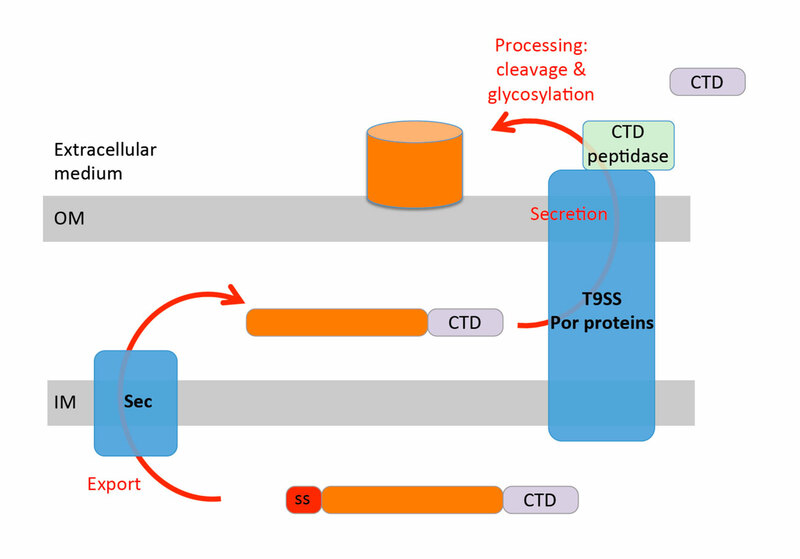 Transport of the gingipain is coupled to processing (cleavage by the CTD peptidase and modification) to anchor the gingipain at the cell surface. The T9SS is poorly characterized. 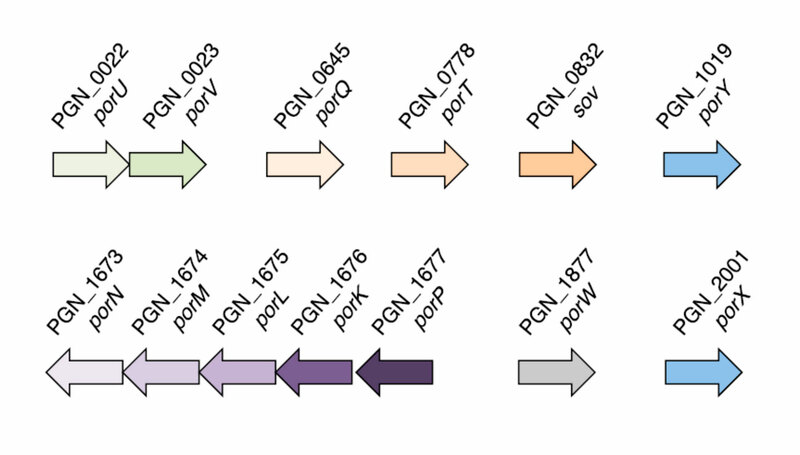 A number of genes, called por, have been identified using substractive genome comparison and have been shown to be involved in gingipain transport to the cell surface (Sato et al., 2010). Genes involved in the secretion/processing of gingipains. The generic name (por) is indicated as well as the PGN number (which reflects the position of the corresponding gene on the P. gingivalis ATCC33277 genome). The genes corresponding to the PorY-PorX two-component system are indicated in blue. It is therefore thought that these subunits assemble a trans-envelope channel that specifically recruits the gingipains and transport them to the cell surface. Interestingly, four of these proteins, PorK, -L, -M and –N, are sufficient to assemble a stable complex of ~ 1.2 MDa that resists native PAGE analyses (Sato et al., 2010). The porY and porX genes encode a two-component sensor and response regulator respectively and it is proposed that these two control the expression of the por genes. We have very recently initiated a study on the different subunits that constitute the T9SS. We have first focused our efforts on the PorM protein. 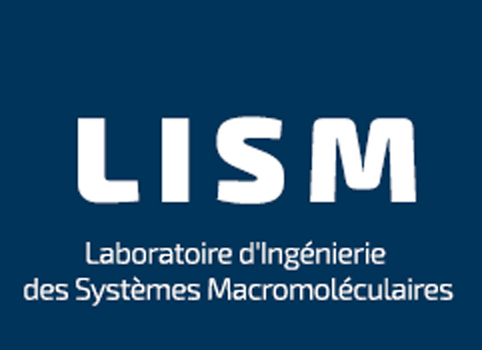 In collaboration with Alain Roussel and Philippe Leone (AFMB), we recently obtained PorM crystals (Stathopulos et al., 2015) and we are pursuing this work to define the structural organization of this protein.